The Ace Hotel New Orleans captures the soul of the Crescent City. The recently renovated Art Deco building on the corner of Carondelet and Lafayette streets is the new home of the hip and swanky Ace Hotel New Orleans. It’s the Portland-based hospitality group’s first foray into the Deep South. The Warehouse District hotel features 234 rooms, rooftop pool, lush courtyard, restaurant, music venue, event spaces and more. To create a space that exudes the rich culture of the city, captures the Ace’s unique approach to hospitality and capitalizes on the almost 90-year-old building’s inherent style, Ace Hotel tapped New York design firm Roman & Williams. 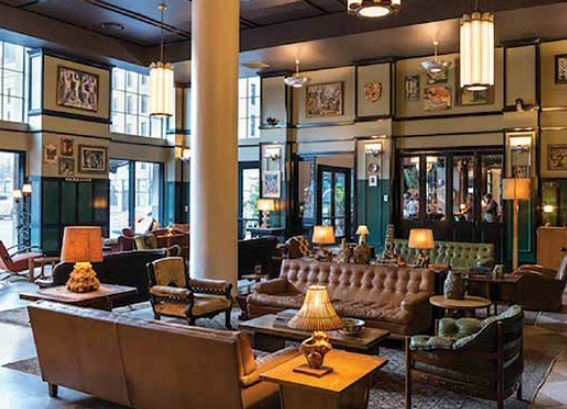 Mimicking the multicultural aspects of the Crescent City, Roman & Williams combined many different design elements to create the rich, complex tapestry that is the Ace Hotel New Orleans. Influences range from 1920s French design (inspired by the Art Deco building) to Romantic Gothic details and African geometries. The palette of dark gray, green and eggplant serve as a backdrop for bespoke furnishings and lighting, setting off the preserved terrazzo floors. Ace Hotel and Roman & Williams made every effort to incorporate local elements into many details of the design. They commissioned 32 southern artists, 13 of which are New Orleanians, to paint impressionistic depictions of swamps and bayou landscapes on the handcrafted armoires in all the guest rooms. Third-generation set painter, Nathan Arthur from the New Orleans Opera House, designed three hanging murals from Mozart’s The Magic Flute that hang in the lobby and inside the hotel’s featured restaurant, dubbed Josephine Estelle. Local DJ and music historian Brice Nice curated vinyl selections; young artists from the Young Creative Agency were tapped to illustrate calendars; and New Orleans sculptor Sadie Sheldon created one-of-a-kind steel baskets — all of which is used to decorate individual guest rooms throughout the hotel. Kelly Sawdon, Ace Hotel Group’s chief brand officer, explained the vision behind the hotel’s design, which emphasizes discovery and unexpected pleasures. “We set out to make a warm, welcoming, relaxed space that was conducive to surprise — a catalyst for genuine, humorous, human moments to happen,” Sawdon says. “From opening day, guests and visitors have brought an animating spirit of curiosity, joy and harmony to the space that’s been wonderful to experience.” Many visitors and guests have tagged the Ace Hotel New Orleans in Instagram photos, revealing their appreciation of the space, capturing everything from the rooftop pool and gorgeous bar to the drippy wax chandeliers hanging in the private dining room (created by L.A.-based artist Michael Schmidt).